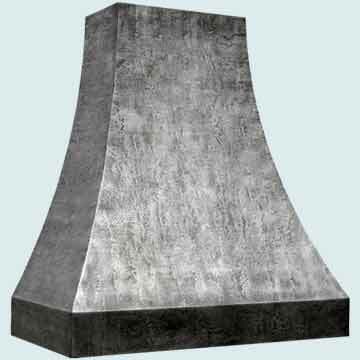 Handcrafted Metal makes zinc Double Sweep range hoods and steel Double Sweep range hoods that are customized to accommodate your kitchen and your taste. With us you can customize every dimension and feature, such as hammering, color tone, and lighting. 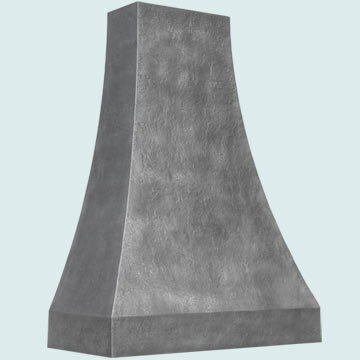 To further customize your zinc or steel range hood you can also choose from additional features, such as elegant bottom bands, hand-wrought straps, clavos, and rivets. Personalized features like these are guaranteed to please. 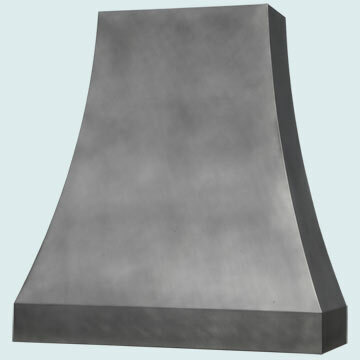 Our zinc and steel range hoods are made with the purest materials available, and are very durable. 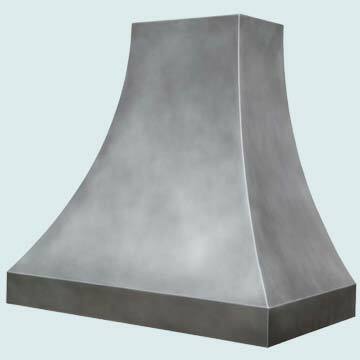 We will work with you to make a superior zinc or steel hood that looks splendid in your kitchen. 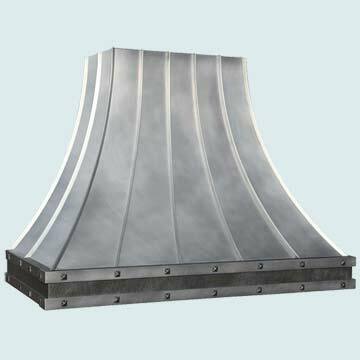 Click on any Double Sweep hood below to see more pictures, and customize it according to your specifications! 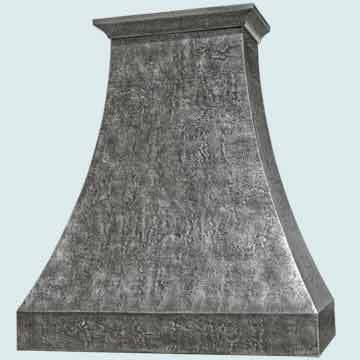 Strong French style elements appear on the bottom mantle band and in the outswept crown. Our Light antique patina combines with the French influences for relaxed, understated elegance. The body is made from smooth 16 gauge zinc. 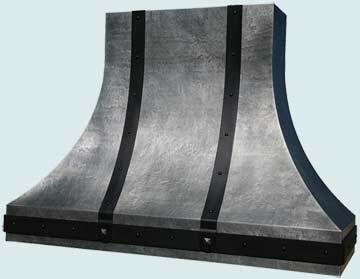 This unique Double Sweep hood has standing seams on the front and side faces. In addition, a pair of zinc straps run around the perimeter of the lower band. The straps are fastened with antiqued zinc clavos, and the lower band is stepped. Additionally, the lower band is textured with our Random hammering. 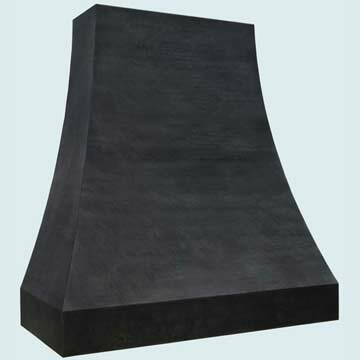 The piece is made entirely from zinc and finished with a hand rub on the natural-colored zinc. The hammered band features our Medium antique patina. 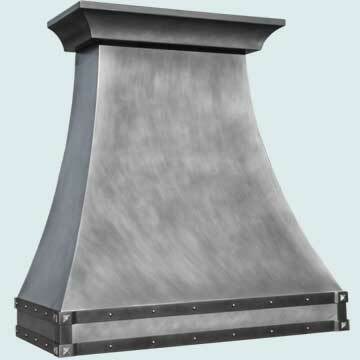 This Double Sweep hood includes a stack with molding at the bottom and a crown at top. The bottom band is recessed and fluted for added detail. Additionally, the entire piece has our Random hammered texture. It's made entirely from zinc and is finished with a Medium antique patina. This large Double Sweep hood includes two horizontal and two vertical straps. The straps are made from darkened steel and have both rivet and clavos fasteners. 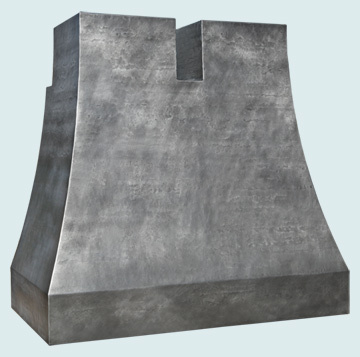 The hood itself is made from Zinc and has some distressed texturing. The entire hood is finished with a Medium antique patina. This Double Sweep hood is shown with one horizontal and two vertical straps. The straps are made from steel and have round rivet fasteners. The body is made entirely from zinc and has our Reverse hammered texturing. Additionally, the entire piece is finished with our Medium antique patina. This impressive Double Sweep hood features hammered standing seams and darkened steel straps. In addition, the straps are fastened with zinc clavos. 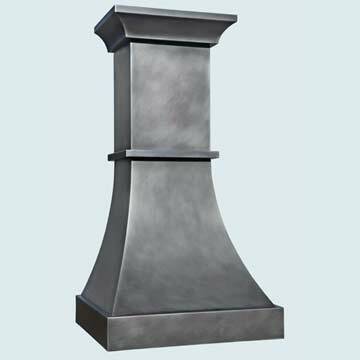 The body was made to mount on a wooden mantel utilizing the holes in the bottom band for screws. The piece is made entirely from zinc and finished with our Medium antique patina. 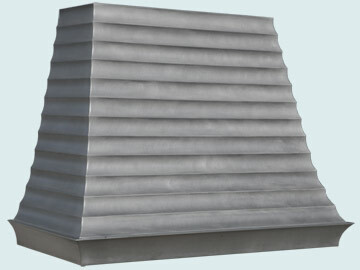 This Double Sweep hood has a crown at the top and a stepped band at the bottom. 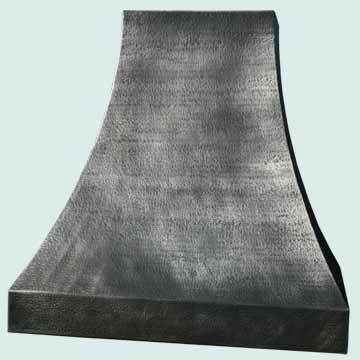 It's fully textured with our Reverse hammering. 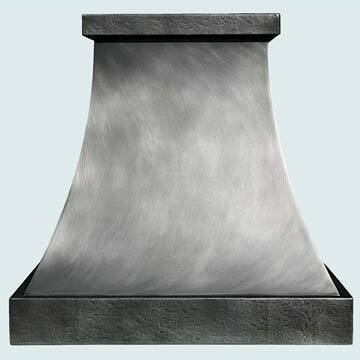 The entire piece is made from 2 sheets of zinc that are welded together, polished, and finished with our Medium antique patina. 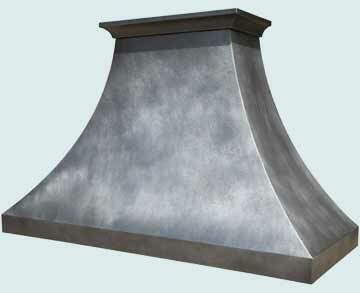 This very tall Double Sweep hood features an angled top to fit against a vaulted ceiling. The lower band is stepped and the entire hood is textured with our Reverse hammering. 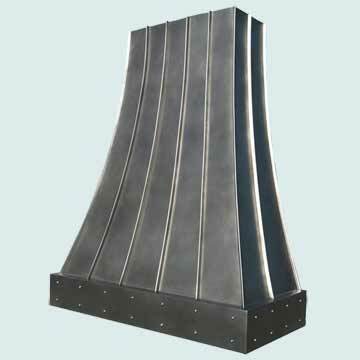 It's made from 2 sheets of our zinc that are welded together to get the extra large size. It is finished with our Medium antique patina. 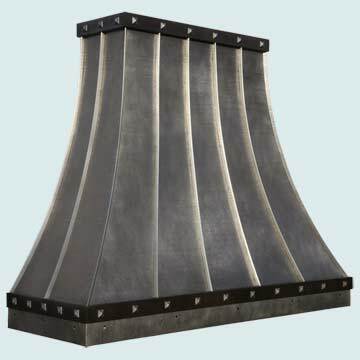 This tall Double Sweep hood is made from steel and has standing seams on the front and sides. The bottom band is stepped and has decorative rivets across the front and sides. 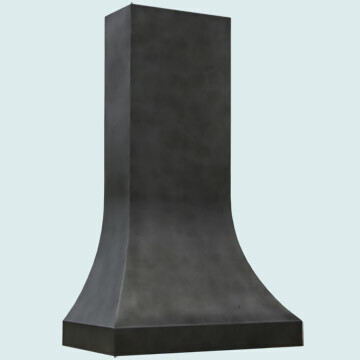 The entire piece is made from smooth steel and finished with our French Grey finish. 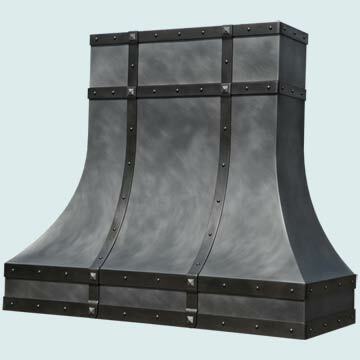 This zinc island hood features blackened steel straps around the bottom band and around the top. Two straps run down the front, and two more run down the back side. These straps are attached with round rivet fasteners. The body is made entirely from smooth zinc and finished with our Light antique patina. This eye-pleasing Double Sweep hood has a crown at the top and a stepped band at the bottom. It's made entirely from smooth zinc and finished with our Medium antique patina. 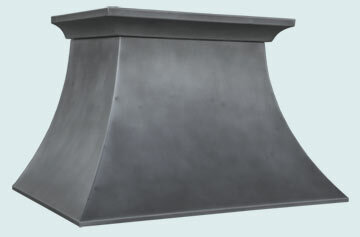 This Double Sweep hood has a crown at the top and a molding at the bottom of the stack. Additionally, the lower band is stepped to add depth to the front. 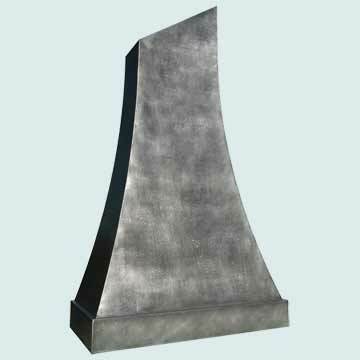 The piece is made entirely from smooth zinc and finished with our Medium antique patina. This classic Double Sweep is made with clean lines and simple geometry. It is made to reach the ceiling in the kitchen. 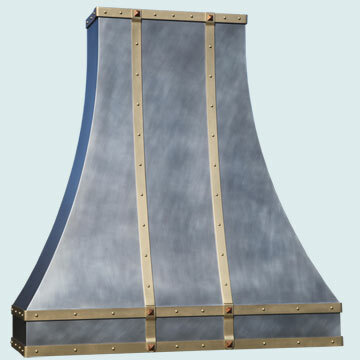 The entire hood was made from Zinc and has a Light antique patina. 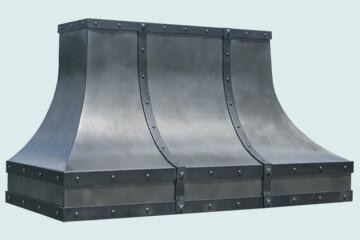 This Double Sweep hood is show with a reverse hammered square crown located at the top. The bottom of the hood also has our reverse hammered texture. 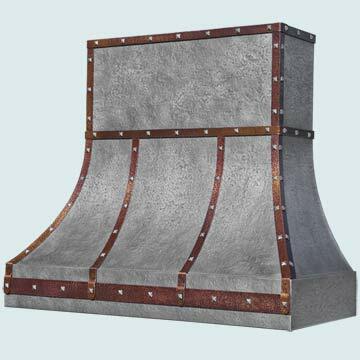 The entire hood is made from Zinc and finished with a Medium antique patina. This Double Sweep hood is shown with a crown at the top. Also, the bottom has an integral band for a clean appearance. The entire piece is made from zinc and finished with our Medium antique patina. This long zinc hood features steel straps around the top and bottom. the straps running down the front lap over the horizontal straps. These straps are fastened with round-head steel rivets and zinc clavos. 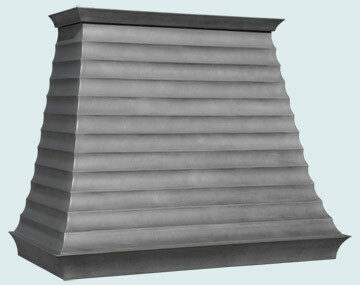 The body of the hood is made entirely from smooth zinc and finished with our Medium antique patina. 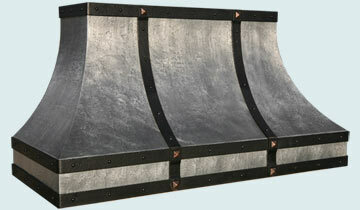 This rustic Double Sweep hood includes five ornamental straps. The straps are made from hammered steel and are attached with round-head rivets. 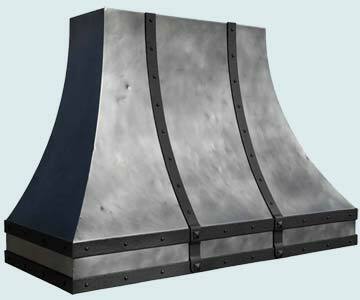 The body of the hood is made from zinc and has been textured with a distressed pattern. It's also finished with our Medium antique patina. 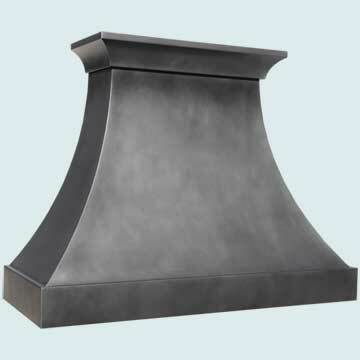 This bold and graceful hood has a tall lower band is textured with our Reverse hammering. The size of the hood requires us to weld and polish 2 sheets of zinc together. It's made entirely from zinc and finished with our Dark antique patina. This fine hood has a Hammered texture on the entire hood. It is made from solid zinc that we random hammer by hand. The size of this hood requires us to weld two sheets of zinc together and polish it before we start hammering. It is finished with a Medium antique patina and hand rubbed. 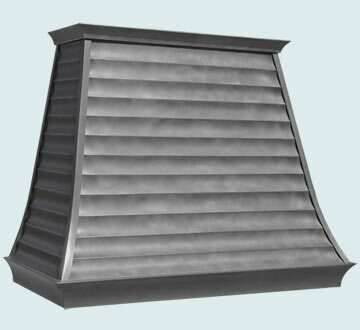 This long zinc hood has a graceful sweep and is still wide across the top of the hood for a bold look. It has brass pot rails on the sides to better accommodate cooking. It's made from smooth zinc and finished with our Medium antique patina. Dual straps on the bottom skirt visually balance the scroll crown. 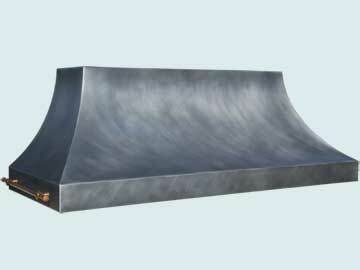 Our medium zinc patina on the hood complements our French Gray finish on the steel straps. 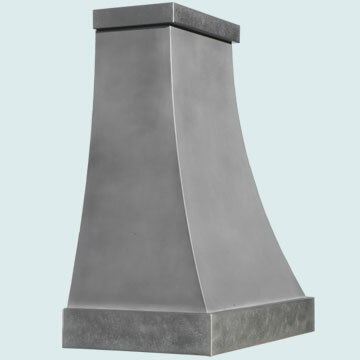 Zinc clavos highlight the corners, while rivets provide detailing. 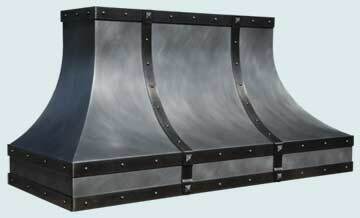 16 gauge all welded zinc hood, steel straps. 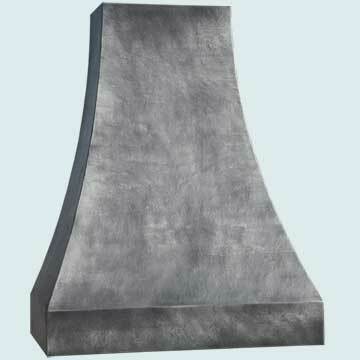 This smooth Double Sweep wall hood commands attention and includes a stack to give it extra height. 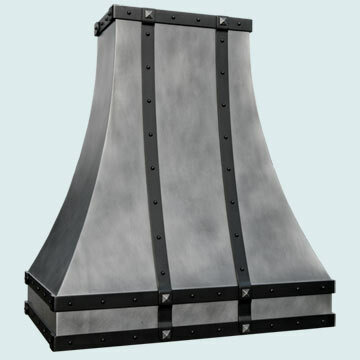 It features double rows of steel straps with round-head steel rivets and zinc pyramid clavos at the intersections. The straps are finished with our French Grey antique. 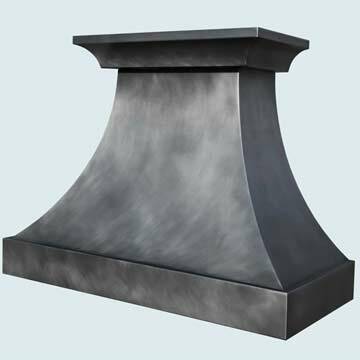 The hood is smooth zinc, and is finished with our Medium antique patina with a hand-wax rub. 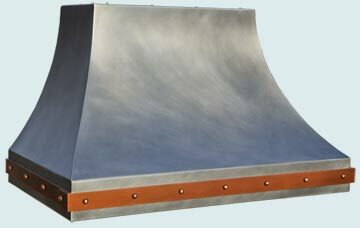 This custom zinc Double Sweep hood features a copper strap around the bottom. The strap is fastened by copper rivets, further accentuating the contrast between the zinc and copper. 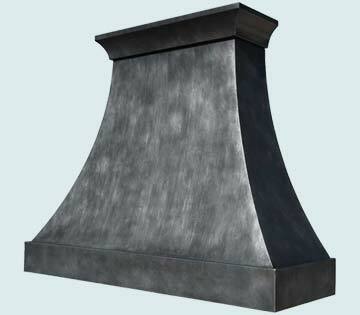 The hood is made entirely from smooth zinc, and has our "Medium Antique Patina" finish. 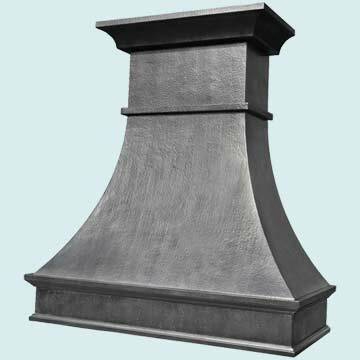 This tall Double Sweep hood is fully textured with our "Reverse Hammering" technique. It's made entirely from zinc, and has our "Medium Antique Patina" finish. 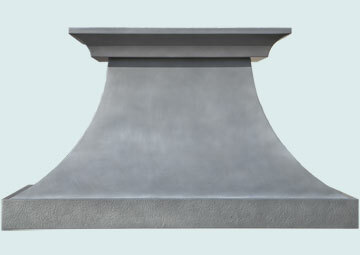 The crown and French mantle base on this custom zinc hood serve to accentuate its wave-like appearance. It's completely smooth, and has our "Medium Antique Patina" finish. This decked-out custom zinc hood is absolutely stunning. The body is textured our "Reverse Hammering" technique, and is adorned with numerous copper straps. The copper straps are textured with our "Random Hammering" technique, and are fastened with zinc clavos. 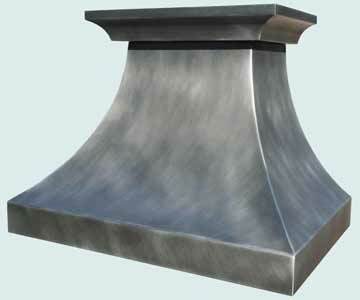 The entire hood is made from the purest zinc available, and has our "Medium Antique Patina" finish. 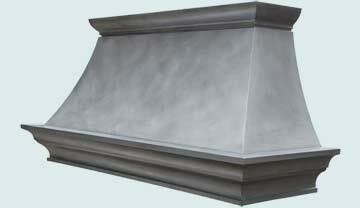 This extra large Double Sweep hood includes five decorative straps. The straps are made from hammered steel and have both rivet and clavos fasteners. The straps are painted black, and the hood is also fully textured with our Reverse hammering. The hood body is finished with our Medium antique patina. This unique zinc hood features matte brass straps, bronze clavos, and brass rivets. The grand 72"H x 66"L size creates a commanding presence sufficient to match the scale of a large kitchen.